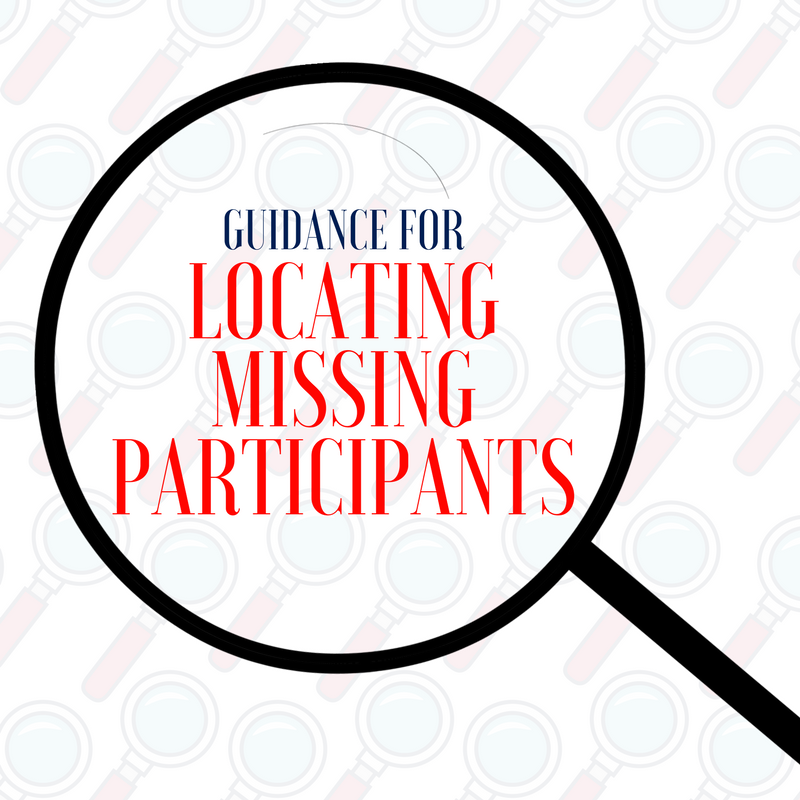 Meanwhile, as a practical matter, fiduciaries of ongoing plans must still confront the problem of locating missing participants, and must do so with incomplete guidance. If audited, they’ll potentially face “ad hoc” enforcement positions by the DOL, which the Council asserts have been inconsistent and, in many cases, unreasonable. This article focuses on the Council’s specific recommendations to the DOL as set forth in their letter. The Council’s recommendations, if adopted, could establish a more complete, consistent and reasonable framework for plans to address the missing participant problem, going forward. The Council observes that the present state of guidance for locating missing participants is woefully inadequate. The most-specific guidance available, in the form of Field Assistance Bulletin 2014-01, addresses the scenario of locating missing participants for a terminating plan. 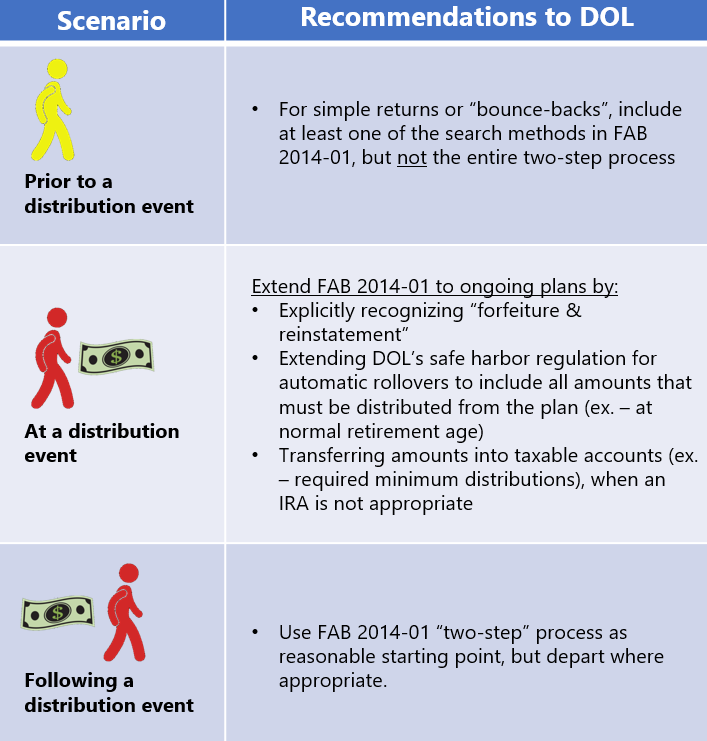 If the missing participant (or their beneficiary) is not located, then the sponsor can distribute the participant’s savings to a) a safe harbor IRA, b) an interest-bearing bank account, or c) to state unclaimed property – with the DOL favoring the safe harbor IRA option. This guidance, while valuable, is limited in that it does little to inform the fiduciaries of ongoing plans, who encounter a broader range of missing participant scenarios. At the time of distribution, if the participant cannot be located, refuses to respond, or does not negotiate a distribution check? After the participant has experienced a distribution event? Unlike the “one size fits all” approach described in FAB 2014-01, the Council’s three questions establish the cornerstone of an adaptive framework for locating missing participants. This framework allows plan fiduciaries to triage their location efforts, based upon the participant’s proximity in time to a distribution event. Placing limits on search requirements for missing participants whose contact information may not be up-to-date, but for whom no distribution event is imminent. The ABC’s recommendations for DOL guidance are summarized in the following table. It should not be suggested that a plan’s forfeiture and reinstatement provisions result in a prohibited transaction. Audits must provide employers with finality, when completed. Data requests must be reasonable. Plans should not be told that they should go beyond the reasonable search steps described in FAB 2014-01. In our view, the Council’s recommendations to the DOL for guidance seem reasonable, and if adopted, would deliver much-needed clarity and consistency to the process of locating missing participants. When combined with measures that promote retirement savings portability (ex. – auto portability), the administrative burden of locating missing participants could not only become much more manageable for plan sponsors, but would deliver better outcomes for participants -- a goal shared by all.